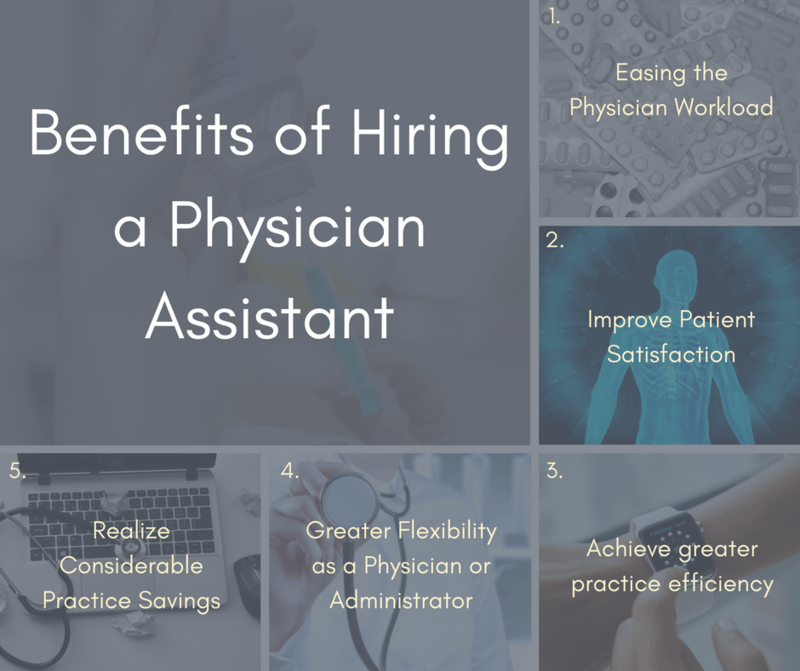 Having a Physician Assistant (PA) on staff can greatly benefit your team or practice. PA’s have the ability to practice medicine in a team environment and can provide a broad range of medical services that are otherwise provided by physicians. PA’s work in conjunction with physicians to deliver the best possible care. They boast a rigorous medical education, versatility in skill set, and a strong commitment to helping traditional practices function better and improving continuity of care. With a PA, you can continue to offer high-quality care at a great value while increasing patient access and reducing patient wait times. If you’re looking to add value to your healthcare team, consider adding a PA to the mix. One of the greatest benefits of hiring a PA is that physicians can shift their workload. PA’s can handle routine office visits, rounds and call while the physician is free to manage more complex cases. With the help of a PA, you can also improve patient flow, as PA’s can see walk-ins, urgent care cases and routine follow-up visits, diabetes care and hypertension management, according to an article by the American Academy of Physician Assistants. Even in an emergency department environment, PA’s can provide both trauma and fast track care. According to a recent survey by the American Medical Association that measured the benefits of employing “nonphysician practitioners” (NPP), solo practice physicians experienced expanded practice, greater efficiency and greater access to care for their patients. The survey also found that physicians that employ an NPP were able to work one day per week less per year on average. Perhaps surprisingly, the physicians surveyed were still able to supply more hours in office visits and patient care while increase net income 18 percent. Adding a PA to your team helps you gain more flexibility and helps to smooth out the workload so you can find a good balance. According to 2002 data from the Medical Group Management Association, which collects data annually comparing PA compensation with their gross charges, “for every dollar of charges a primary care PA generates for their practice, the employer pays on average 28 cents to employ the PA. For surgical PA’s, the employer pays 32 cents for every dollar of charges generated. Hiring a PA will boost patient satisfaction significantly for a number of different reasons. First, with a PA on your staff, you can slash patient waiting times and increase their access to care. You’ll have a lot more scheduling flexibility as a physician, but your patients will have more flexibility when it comes to scheduling appointments. If there is no need to see a physician, having a PA on staff free up a lot of time. It’s impossible to be available to every patient all the time as a physician. Additionally, patients can help communicate prevention strategies, medication regimens, follow-up plans, newborn care, diet and exercise advice, and more. Along with providing care, PA’s can also fulfill the role of patient health educator, nutritionist, and smoking cessation coach. If you’re interested in hiring a top physician assistant, contact us today to find out how we can get you connected to the industry’s top talent. If you’re interested in becoming a physician assistant, it’s a fruitful career path. According to a recent health study by the American Medical Association, 86% of physician assistants reported high job satisfaction, compared to 39% of doctors. As you consider which path you with to take in the medical field, consider work-life flexibility enjoyed by physician assistants compared to full-on doctors. If you’re looking for a healthcare hire in another area of focus, visit our services pages to learn more about how we can help or whether we can recruit to serve your business’ needs.